Harmonic Motion Microwave Doppler Imaging (HMMDI) is a novel imaging modality to image electrical and mechanical (elastic) properties of body tissues. In the proposed project, it is aimed to accelerate the elapsing time in measurements, improve the accuracy levels in HMMDI and enhance its clinical applications. Conventional method for breast cancer diagnosis, Mammography, suffers from utilization of ionizing radiation, difficulty in imaging of dense breasts, inconclusive results and patient discomfort. Top and Gencer (2014) proposed the HMMDI method as promising hybrid method for breast cancer detection, which may overcome the limitations of the Mammography. In this method, local vibrations at a focal point are created by focused ultrasound waves. At the same time, a narrowband microwave signal is transmitted to the vibrating region. Due to local vibrations, Doppler component is observed in the spectrum of the received signal. The level of Doppler signal is related to the mechanical and electrical properties of the vibrating region. By scanning the focal region inside the breast volume, HMMDI image of the tissue can be constructed. Technical feasibility of the method has been shown via analytical (Top and Gencer, 2014), numerical and experimental (Top, 2013) (Top et. al, 2016) studies. In this project, studies for improving accuracy level, safety and accelerating the experimental measurements will be conveyed. In order to improve the sensitivity, the main microwave component in the received signal component will be cancelled out using a active signal cancellation. Spatial accuracy will be improved via utilization of multiple antennas. To decrease the scanning time, feasibility of continuous mechanical scan of the ultrasound probe will be investigated. Numerical studies for investigating electronical scanning of the focus of ultrasound will also be done. In addition, studies for real time monitoring of system safety, such as cavitation onset, and temperature rise will be done using simulations and experimental set-ups. 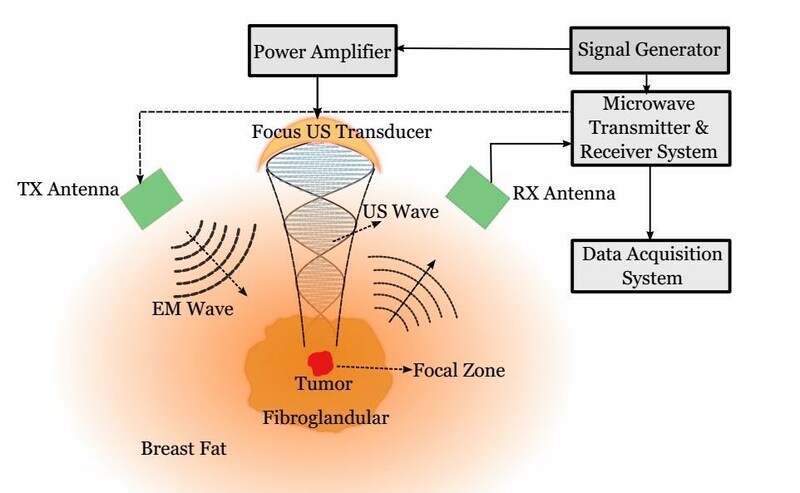 Moreover, by enhancing the hybridization of microwave imaging with HMMDI, dielectric distribution inside the tissue will be monitored yielding a better liability for tumor detection. The studies will be conducted via phantom materials to investigate the feasibility of HMMDI in breast cancer diagnosis. Overcoming current encountered problems will accelerate the translation of this method to clinical studies. The study can later be developed to be adapted on cancer diagnosis over other tissues (liver, prostate, etc. ).